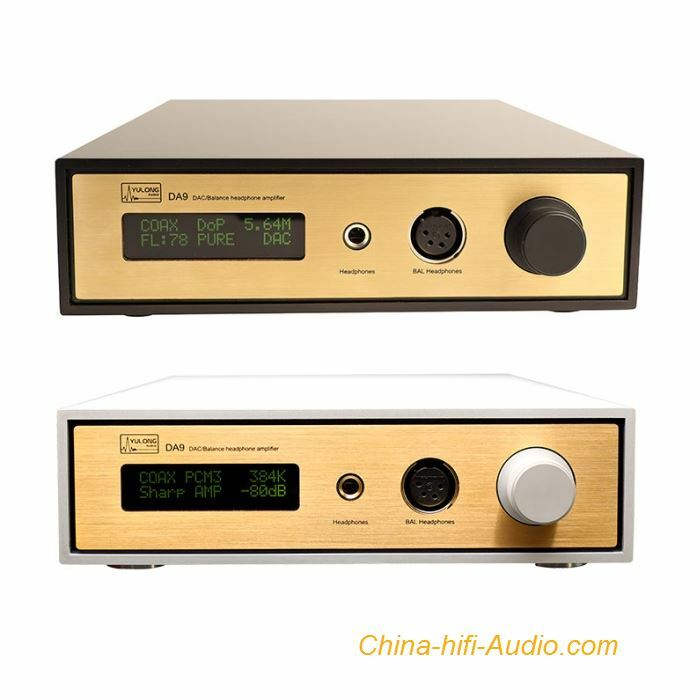 Yulong DA9 DAC balanced Headphone Amplifier Audio flagship decode machine with preamplifier. DSD128 and PCM384K are supported through ALL digital inputs of DA9. The state of the art AK4497 DAC chip supplemented by full balance line preamp and Class A, JFET input balanced headphone amplifier makes DA9 your perfect choice for the core of your playback chain. Fully balanced high current preamplifier. Fully descrete and balanced, JFET input, DC coupled Class A headphone amplifier. AK4497 decoder chip paired with 1.7nV ultra-low noise regulator at reference voltage and analogue supply. OPA1611 with ultra low distortion for LPF and high current OPA1622 for output buffer. Dop64 and Dop128 supported through SPDIF, Optical and AES. PCM 384KHz 24bit supported through SPDIF, Optical and AES. USB supports DoP64, DoP128, Native DSD64,128, 256, and PCM 16-32bits 32-384KHz. Highly user customizable digital filter. 99 steps volume control to pair with headphones in different impedance and sensitivity. Elegant and sturdy gold plated front panel and aluminum housing. Unique claw-style suspension feet. Please use high quality USB cable. Don't connect DA9 via a USB hub, or extension cable (for example most USB ports in the front of tower case).